The Freedom Bath is one of the most easily accessible baths ever built. 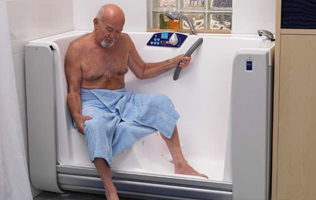 In residential care environments, full long-side access makes both independent and assisted bathing safer and easier. • The unique powered Roll-Door provides simple access by sliding in under the tub during entry and exit. • Freedom Bath has an integrated contoured seat for bathing and offers superb comfort and excellent immersion. • Therapy options include Air-spa. A lift-accessible version with higher floor clearance is available for assisted bathing and integrates with the ArjoHuntleigh Stedy, SARA 3000 and SARA Plus. Freedom Bath can enhance quality of life by maximizing the level of active involvement with the bathing process. Lift integration with the side-entry Freedom Bath means no manual resident handling is required during assisted bathing sessions. Controls are positioned for convenient access by either independent bather or caregiver. This system is a highly efficient solution for independent bathing and can reduce demand for assisted bathing. Freedom Bath brings independent bathing within reach for more ambulatory residents, as the bath side is no longer a barrier to bathing. This can mean that less staff resources are needed for assisted bathing.